13.5 kg. , 29.8 lbs. On the west side of the Mississippi River Delta where the water is dirty and constantly frequented by the third most common shark species involved in attacks on humans worldwide, the bull shark, there exists a summer retreat to a large number of Lobotes surinamensis, commonly known as “tripletail”. Most of the oil rigs in this area are old and full of damaged pipes due to decades of wear and tear from destructive hurricanes such as Katrina. Luckily for the tripetail, spearfishing around these oil rigs is not for the feint of heart and catching the species on rod and reel takes professional knowledge possesed by a select few guides in the area. On September 28, exactly 4 years after I broke the world record for tripletail on a pole spear, my son and my good friend Henry went out with me behind the shrimp boats searching for yellow fin tuna. I have been diving for roughly forty-six years now, and while I find competing for yellow fin tuna with sharks of all sizes behind shrimp boats to be an adrenaline rush, it is a walk in the park compared to spearfishing under rusted metal structures loaded with braiding fishing lines all while not being able to see what type of creature is bumping into your body. After a few hours of unsuccessfully chasing tuna we stopped at an oil rig on our way home. On this day the water was murkier than usual due to the Mississippi River having been unusually high making visibility less than 3’. 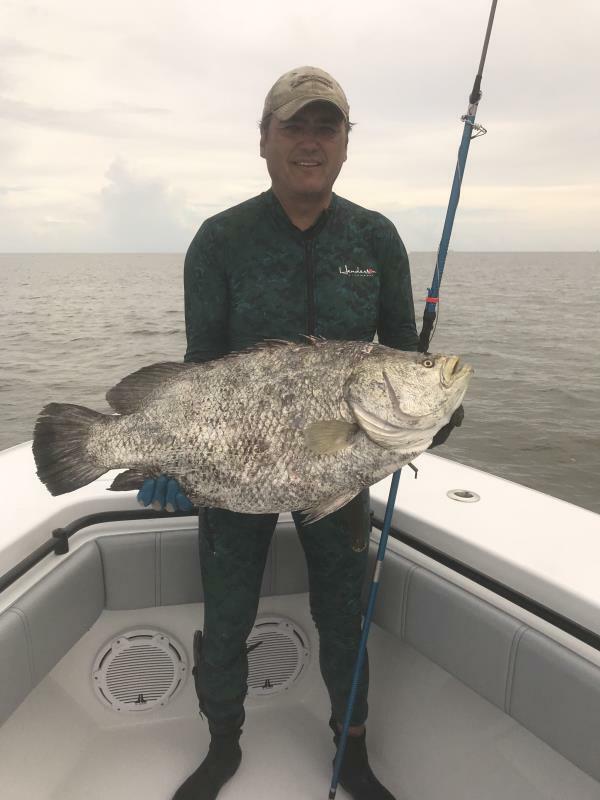 On my first dive, I shot an average size tripletail for this area of 17lbs. After a few unsuccessful dives, a much larger fish appeared out of the dark muddy water and placed itself right in front of me. I was afraid that my pole spear wasn’t going to penetrate all the way through its body due to its tough scales, but the shot was well placed. Even though the spear didn’t go all they through, it did lodge in firmly enough for the fish to pull me around the rig while I was kicking as hard as I could towards the surface for air. Although my pole spear was bent in the battle and I received a few abrasions on my arms and legs, at the end of the day I was able to breach the surface without loosing the spear and a record size fish of 29.8 pounds. It was a memorable day in the water and it makes even more special that I had Henry and my son, Brandon, to share that great moment with.